William Livingston was born on 30 November 1732 in Albany, NY, the fifth son of Catharina Van Brugh and Philip Livingston. William was a signer of the U.S. Constitution and his brother, Philip Livingston, was a signer of the Declaration of Independence. Livingston spent much of his time growing up with his Dutch maternal grandmother. He would boast that he had no English blood in him, only a mixture of Scottish and Dutch. He received his early education from local schools and tutors. At age 14, Livingston was sent to live a year with a missionary among the Iroquois Indians in the Mohawk Valley. He enrolled at Yale University upon his return in 1738 and graduated in 1741. He went on to New York City, where he studied law and became a law clerk for James Alexander and William Smith. There, in 1742, he married Susannah French, the daughter of a wealthy New Jersey landowner, and they had thirteen children. "As many children as there are states in the Union," he would boast. Livingston's daughter, Susannah, married John Cleves Symmes in 1780 and became the stepmother-in-law of President William Henry Harrison. Another descendant of William Livingston was Julia Kean, wife of United States Secretary of State and New York Governor Hamilton Fish. Livingston was admitted to the bar in 1748 and practiced law in New York. He founded the Independent Reflector, a weekly newspaper, in 1752. Livingston was elected to the New York Legislature in 1759 where he remained active until his political allies lost power in 1769. He had simple tastes and a love of the country. He never wore a wig and was described as "plain and genteel." His own description of himself was "a long nosed, long chinned, ugly looking fellow." He started buying land near Elizabethtown (today Elizabeth), NJ, in 1760. He moved to Elizabethtown in 1770, where he built a large country home to house his growing family. The house known as Liberty Hall, still stands today. The home became a center of activity, in part due to its proximity to Francis Barber's Academy and visits from young men. (Alexander Hamilton, a boarder at the Academy, was a frequent early visitor.) Three of Livingston's daughters - Sarah, Susan, and Catherine - came to be known as 'the three graces.' The height of social activity during this era was the wedding, at Liberty Hall, in April 1774 of Sarah to a young New York lawyer, John Jay. After attaining considerable influence amongst the local patriots, Livingston was elected to the Continental Congress from July 1774 to June 1776. In October 1775, he was commissioned a Brigadier General of the New Jersey Militia. He once wrote, "I can assure you I never was more sensible of my own 'nothingness' in military affairs...the fatigue I have lately undergone; constantly rising at two o'clock in the morning to examine our lines which are very extensive, till daybreak." He resigned in August 1776 when he was elected Governor of New Jersey - holding the office until his death in 1790. For much of the time between 1776 and 1779, the family was located in Parsippany for safety. Liberty Hall was frequently visited by British troops or naval forces since there was a substantial reward for Livingston's capture. Twice his home "Liberty Hall" was attacked by the British with the objective of capturing him, but each time he was forewarned and he eluded them. Once when he was warned that nine fellows were without arms and "dressed like countrymen" to try and capture him he wrote in reply "They are as great blockheads as they are rascals for taking so much pain and running such risk to assassinate an old fellow whose place might instantly be supplied by a successor of greater ability and greater energy." The family returned in 1779 to begin restoring their looted home. Livingston led the New Jersey Delegation to the 1787 Constitutional Convention in Philadelphia, PA, and was one of the signers of the U.S. Constitution. He was a prolific writer, often using pseudonyms for articles, but his writing was such that George Washington would at times enlist his aides to read his dispatches. After his wife's death, his health declined rapidly and he lived just another year. He was followed as governor, by his friend, William Paterson, whose daughter would marry his brother's grandson. 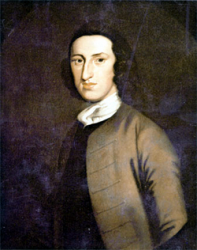 William Livingston died on 25 July 1790 in Elizabeth, NJ. He and his wife were both buried first in the family vault in Trinity Churchyard, in Manhattan, New York City, but were re-interred with their son, Brockholst Livingston, in a vault at Green-Wood Cemetery in Brooklyn, NY, on 7 May 1844.